Schoology virtual classroom plugin for students: If you are student who is already a part of a course or a member of a specific group on Schoology LMS you have the option of joining a virtual session within that course or group. Select Courses or Groups in the top menu. Click See All Courses / Groups. Select the course or the group you have been added to. 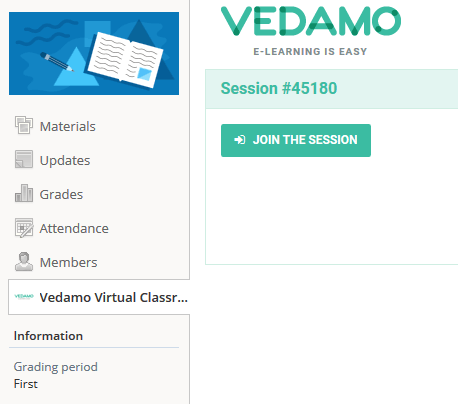 From the left-hand side menu select Vedamo Virtual Classroom. Click Join the Session button. Note: If there is no active session at the time, the message below would appear. Please speak with your teacher for more information on joining the sessions.